gourd shell, stipple the surface, add depth with pyrography tipped pens, and cut a filigree pattern in the prepared surface to simulate air bubbles. 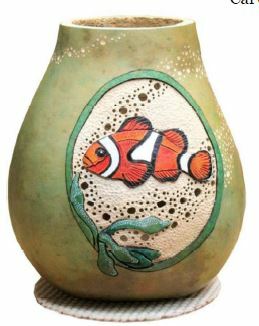 The Clown Fish design, frame, gourd will be painted with acrylics and stained with water based inks. Optima, Dremel or similar tools w/flexible extension, 1/8 and 3/32 collets or adjustable chuck. if the gourd is more than 1/4 thick. Otherwise I suggest that it not be painted in order to see if you are carving too deep). 2. Trace the clown fish design on the surface of the gourd using the red pen. You will be removing some of the gourd surface. Draw an 'x' on the area to be removed. 3. Using a pyrography pen skew tip to burn the major lines in the fish drawing. Any flat pointed tip will work. 4. Using the inverted cone carve the inside of the fame and outside of the Clown Fish and Sea Anemone. Use the smaller inverted cone to carve the fins and jaw line of the fish. 6. Use a 1/8 ball bur to stipple the background surrounding the fish. 7. Using the filigree bur simulate the air bubble rising from the reef. 8. Lightly remove the surface of the lower jaw, gills, and eye of the Clown Fish using a ball bur. Using a drum remove the shell at an angle from the lower Sea Anemone and lower fin. 9. 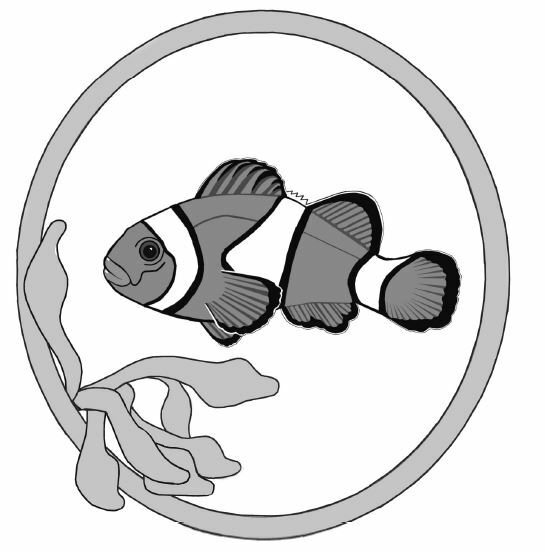 Using the Burning pen point outline the inside and outside of the frame as well as the Clown fish and Anemone. 10. Paint the clown fish with Memory Inks Burnt Orange and Orange. Paint the black scales with black acrylic paint. The black can also be burned with a round pyrography tip. 11. Color the gourd frame with memory ink and highlight the Anemone with white paint. 12. Stain the remainder of the gourd with Memory ink. 13. Continue the air bubbles outside of the frame using the 1/8 inch round bur. 14. Seal the gourd using clear matte spray or sanding sealer.